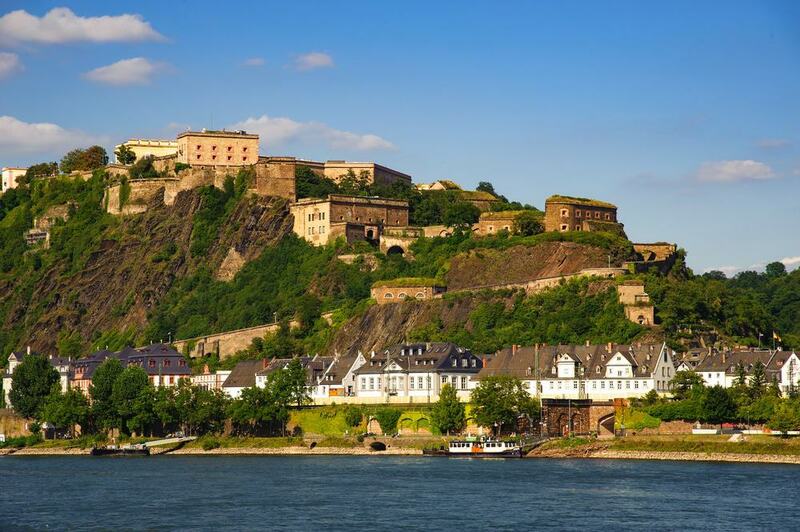 In the UNESCO-listed Upper Middle Rhine Valley, Koblenz is a 2,000-year-old city where the Moselle joins the Rhine. Right at the confluence of those rivers the Teutonic Order founded one of its first commanderies in the 13th century and where the immense Frankish Empire was divided up in the 800s. To honour that history, a monumental statue of Kaiser Wilhelm I was unveiled here at the end of the 19th century. You could make an epic journey upriver, on the Rhine Castles Trail, where castles and palaces mingle with vineyards on the steep valley sides. 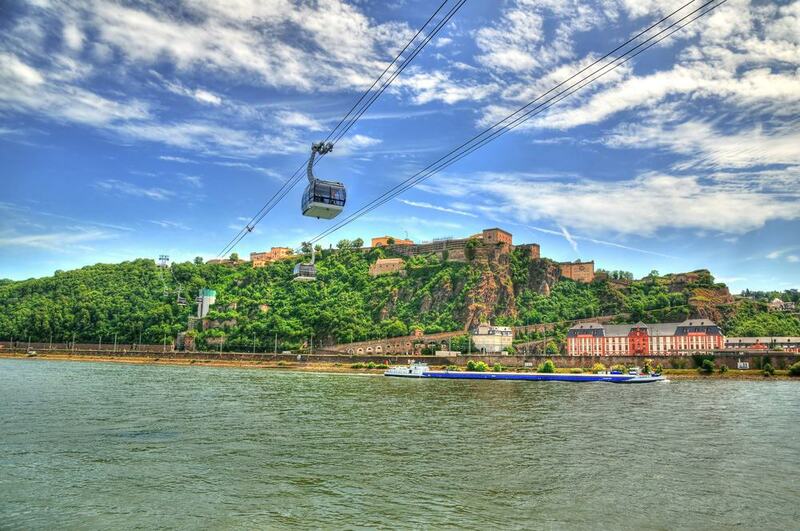 And if you’d prefer to keep things local be sure to ride Koblenz cable car, which carries you across the river up to the Ehrenbreitstein Fortress on the opposite bank. The confluence of the Moselle and Rhine Rivers has always had special meaning in Germany, as at this exact spot there was an early commandery for the Teutonic Order. 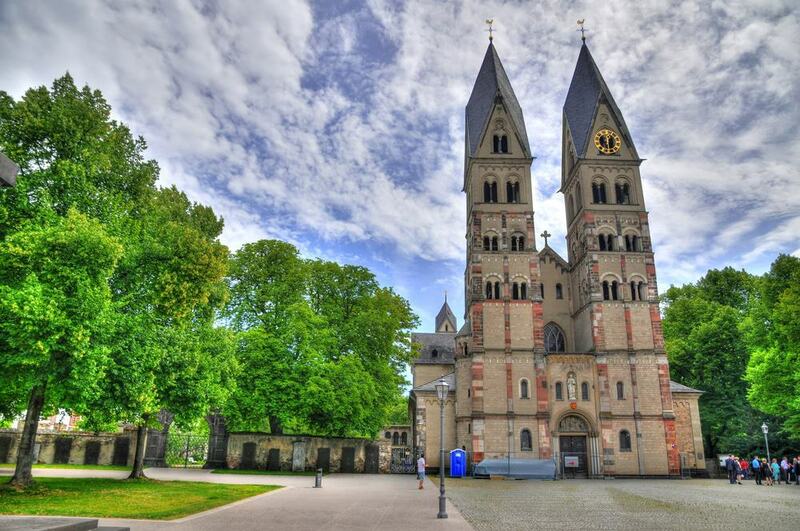 The Teutonic Knights arrived here in 1216 at the behest of the Archbishop of Trier Theoderich von Wied. In 1897 a large scale equestrian statue of Kaiser Wilhelm I was raised at this location nine years after the emperor’s death. The original monument was imbued with Imperialist iconography and was meant to rouse German nationalistic fervour. That 37-metre monument was destroyed by bombing in the Second World War and because of its controversial subject wouldn’t be reconstructed until 1993, after great debate. Up to that time the empty pedestal stood as a monument to German unity. One of the first things to decide when you arrive in Koblenz is when you’re going to take a trip on the cable car. This lifts you across the Rhine and up to the Ehrenbreitstein Fortress. Just under 900 metres long, the system has 18 cars, and its capacity of more than 7,500 passengers an hour is higher than any other cable car in the world. On the crossing you’ll have a bird’s eye perspective of the Upper Middle Rhine’s World Heritage landscape and the mighty river itself. The view is even better if you’re on car 17, which has a glass floor but obviously isn’t for people with vertigo! Try to catch a car around sunset, when the light is stunning. The high spur 118 metres above the right bank of the Rhine has been defended by a fortress since the 11th century. And up to the start of the 1800s this complex was besieged, destroyed and swapped between the French and the Archbishop Electors of Trier, princes of Saxony and then the Prussians, over hundreds of years. When the French withdrew in 1801 they blew up the stronghold to avoid the Prussians having a fortress just a few metres from what was then French territory on the left bank. The current fortress was completed by the Prussians in 1828 and is the second largest in Europe. 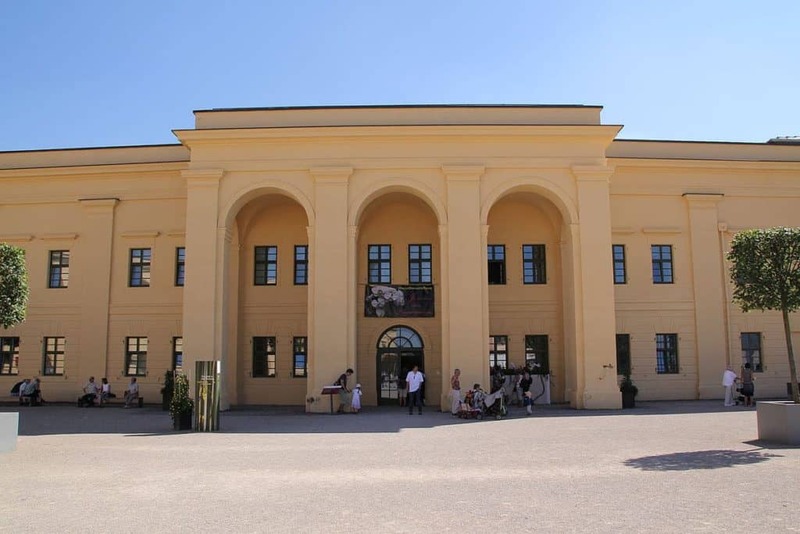 Inside the Ehrenbreitstein Fortress is the multi-faceted Landesmuseum, which has exhibitions on Rhineland-Palatinate’s cultural history, viticulture, photography and archaeology. One of the most fascinating things to see is the Greif (Griffin) canon, which, at more than five metres long, was one of the largest canons cast in the 16th century. The showpiece of the photography exhibition are the works of the early 20th-century photographer Jacob Hilsdorf, who took portraits of many famous figures from the era, from nobility to the artist Max Liebermann. Whenever you come the museum will have all kinds of temporary exhibitions. These can cover anything from famous vintners to upcoming German photographers, and artefacts like hoards of coins found under during excavations of the fortress. Willi-Hörter-Platz in the town hall’s courtyard is a much-loved fountain framed by those Renaissance and Baroque Jesuit buildings. The Schängelbrunnen, showing a boy spitting water at irregular bursts into the basin, was designed by the sculptor Carl Burger in 1940, and has a slightly complicated meaning to explain. The inspiration came from the city’s anthem, the Schängellied, written in 1914. This is about the mischievous exploits of the city’s boys, known as Schängel. The name is actually French in origin: Boys born in Koblenz during the city’s occupation were all known as “Jean”, which became “Schang” in the local dialect. The Schängel in the fountain sums up that sense of lovable roguishness that is valued in this part of Germany. A few minutes upriver and you’ll be at one of the most feted castles in the Upper Middle Rhine Valley. Schloss Stolzenfels has been around since the 14th century but was destroyed by the French in the Nine Years’ War at the end of the 17th century. It was left to decay until the land was gifted by Koblenz to Frederick William IV of Prussia in 1823. A little later he rebuilt the castle in a picture-book Gothic Revival style, according to the Romantic ideals of the period. Getting there is half the fun as you have to trek through gardens on a long, twisting path. At this fairytale building you’ll be given a guided tour, learning about the intricacies of 19th-century etiquette, admiring the virtuoso woodcarving inside, and even having to change into slippers to help preserve the fine parquet floors. 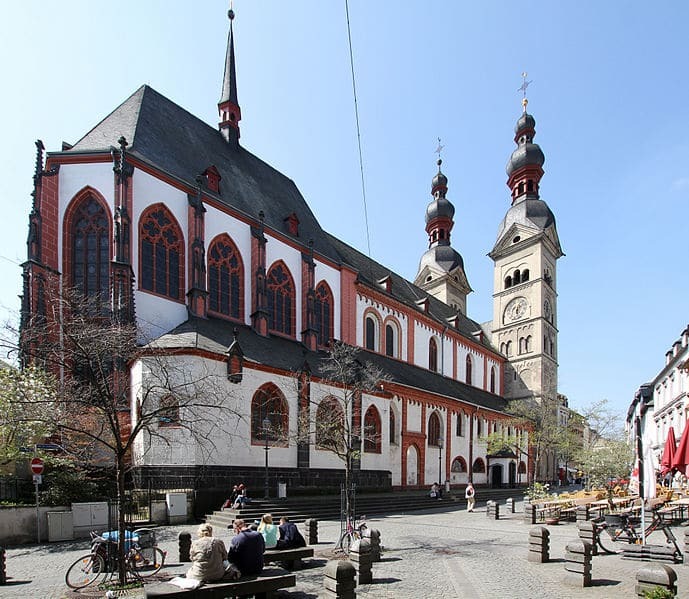 In touching distance of the Deutsches Eck are the pointed Romanesque towers of the oldest church in Koblenz. Once attached to a monastery, the Basilica is part of that UNESCO World Heritage Site for the epochal events that have taken place since its foundation 1,200 years ago. It was at this place in 842 that 110 representatives negotiated the division of the Frankish Empire. Most of the architecture is from the 12th century and although the church did take damage in the Second World War, this was reparable. Undamaged in the attack were the stunning star vaults above the choir and nave. 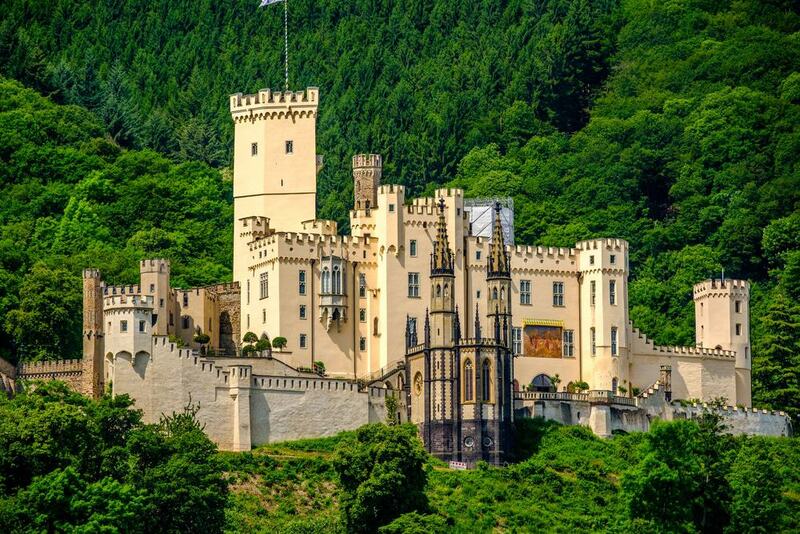 Between Koblenz and the town of Bingen, less than an hour to the south, there are more than 20 castles on the river. The Rhine Castles Trail also passes through three of Germany’s main wine growing region. The landscape is included in the Upper Middle Rhine Valley UNESCO Site, and is a veritable wonderland for walkers. A classic hiking trail will be high on the walls of the valley, weaving through vineyards and with dreamy views of the Rhine at every step. 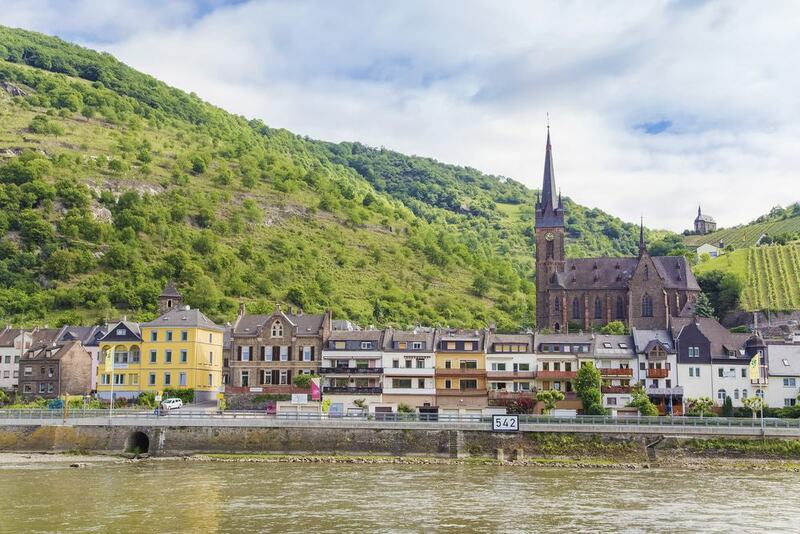 The choice of things to see on the way is vast, but you have to make a stop in the impossibly cute Medieval town of Boppard, and make time for Oberwesel where the mighty Schönburg castle is posted far above the Rhine. The prince, Clemens Wenceslaus of Saxony built this ceremonious Neoclassical palace on the left bank of the Rhine from 1777 to 1793. He was the uncle of the French King Louis XVI and was forced to flee Koblenz following the French Revolution and War of the First Coalition, during which the city would come under French control. 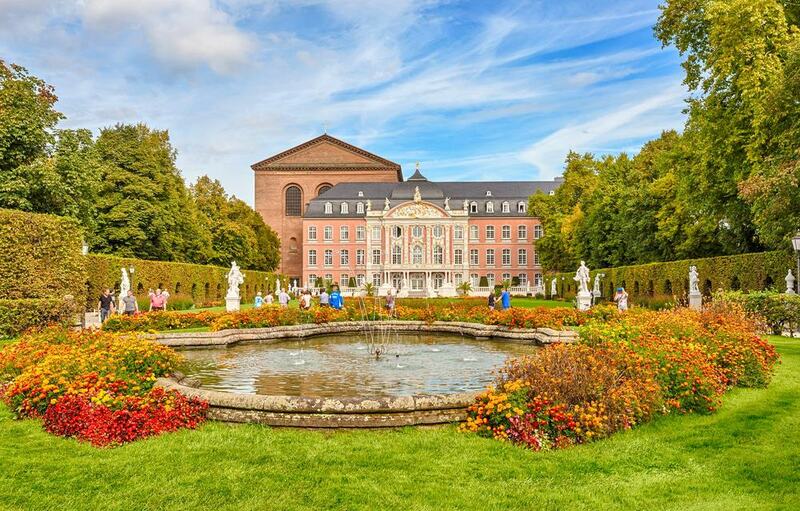 The palace was passed to Prussia in 1815 and would be frequented by Prussian royalty for the next 100 years. It was badly damaged by bombing in 1944, but was quickly rebuilt and its facade was restored according to the original 18th-century designs. Now, the stylish Grand Café, with herringbone floors is open inside. You can watch the river from the terraced gardens in front and see the monument for Father Rhine and Mother Moselle. 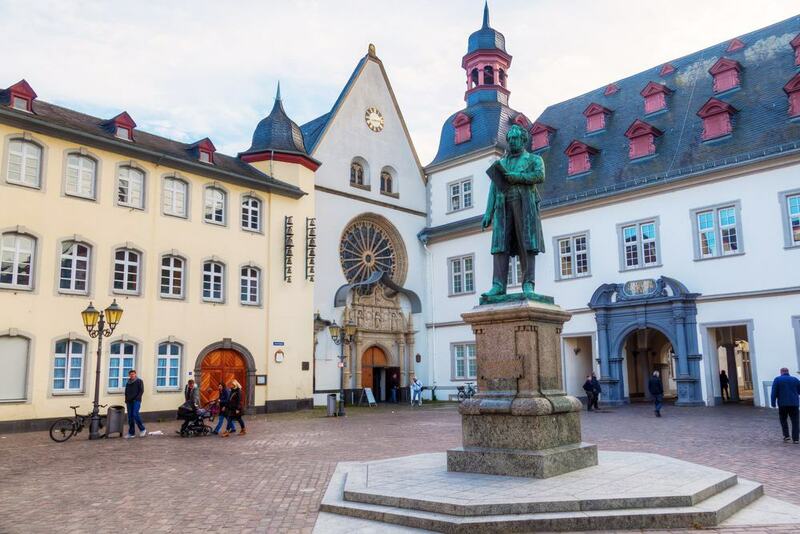 This square in the middle of Koblenz’s Altstadt takes its name from the Jesuit order, which was in Koblenz for just shy of 200 years until it was expelled in 1773. On the south border of the square, the Baroque former Jesuit college, built at the end of the 17th century, has become Koblenz’s town hall. This is flanked by domed towers and with a passageway through a grand portal. Huddled in the southeastern corner of the square is the Jesuit church from the 1610s. Take a while to study the tympanum in the Renaissance portal, which has sculptures of St John the Baptist, as well as Ignatius of Loyola and Francis Xavier, the founder and cofounder of the Jesuits. There has been a church at this location for 1,600 years, going back to when a hall from the reign of the Roman Emperor Valentinian was converted by Christians. Looking at the Liebgrauenlirche from below you’ll see that its towers have Baroque onion domes, and these were fitted at the end of the 17th-century following bombardment by the troops of Louis XIV in 1688. Pass under the figure of Mary and Child and look up at the Late Gothic rib vaults in the nave and choir, as well as the groin vault in the gallery. In the south aisle is the 17th-century altar of St Nicholas, while there’s also a 14th-century wooden crucifix and tombs for local noble families going back to the Renaissance. In the Langemarck-Kaserne (barracks) dating from the 1910s is one of Germany’s biggest military technology exhibitions. 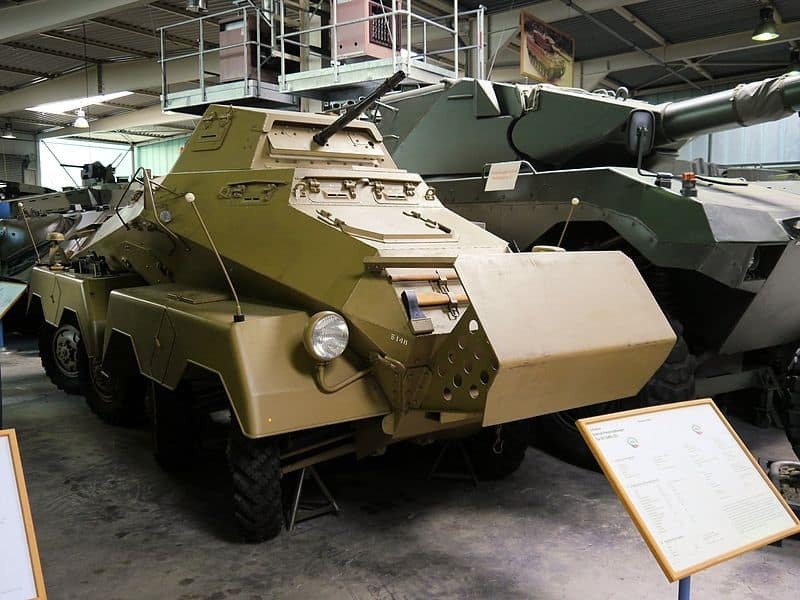 The collection is organised by the government to help train soldiers and engineers, but is also open to the public. If you’re into military equipment you’ll have to travel a long way to see something as impressive: On five floors there’s a big cache of hardware, starting with planes (look for the Lockheed F-104), tanks (Leopard I and II), helicopters and heavy guns on the ground floor and moving up to lighter exhibits like tactical uniforms, light arms, ammunition and communications technology. One of Koblenz’s noble squares, Am Plan owes its current style to Clemens Wenceslaus of Saxony, who had the plaza redesigned in the 1770s. The square’s historical interest lies in its Baroque architecture on the north side. Look for the commandant headquarters beneath the towers of the Liebfrauenkirche. This was the seat of the fortress commander, and then a fire station for most of the 20th century. Looking around, you’ll come across a plaque for Henriette Sontag, marking the birthplace of one of the 19th century’s most famous sopranos. The fountain meanwhile dates to 1806 and was once fed by the Electoral Palace’s Metternich aqueduct. Outside the Basilica of St. Castor, go in for a better look at the Kastorbrunnen, a French-era fountain erected in 1812. The fountain is a real curio as it bears an inscription by the French prefect, Jules Doazan, prematurely praising Napoleon’s conquest of Russia, a campaign that would actually end in disaster. In 1814, after the rout of the French army, Koblenz’s Russian commandant ordered the humorous inscription beneath the Doazan’s initial message, reading: “Vue et approuvé par nous, le Commandant Russe de la Ville de Coblence” (seen and approved by the Russian commandant of the city of Koblenz). A satellite of the Deutsche Bahn Museum in Nuremberg, this attraction opened in a 100-year-old wagon repair shop in 2001. On Saturdays you can come and see more than 20 vintage locomotives and carriages. Although there are a few steam engines, the museum’s specialty is electric railway travel, and the prized exhibit is the Trans Europe Express, which you can ride. The preserved wagons are a testament to luxury rail journeys in the early and mid-20th century. And along with the actual rolling stock you can view a cross-section of an engine, models, seats, black and white photographs and posters in the museum’s showcases.